Screenwriters: Édouard Deluc, Thomas Lilti, Etienne Comar & Sarah Kaminsky, liberally adapted from Noa Noa by Paul Gauguin. Previewed at: The Chauvel Cinema, Paddington, on Friday 1 June. The lives of great artists have always been grist for the mills of cinema. Historically we’ve seen Gauguin depicted before, by Anthony Quinn in Vincente Minelli’s 1956 Lust for Life (Quinn won the Oscar for Best Supporting Actor, although the film’s main focus was Vincent van Gogh), but this is just one of many movies about famous artists. To single out a few from the past, there are John Huston’s Moulin Rouge, his 1952 film about Henri de Toulouse-Lautrec, Carol Reed’s 1965 pic about Michelangelo, The Agony and the Ecstasy, and James Ivory’s 1996 Surviving Picasso. More recently we’ve seen Mike Leigh’s life of J. M. W. Turner, Mr. Turner in 2014 and, just last year, Stanley Tucci’s film on Alberto Giacometti, Final Portrait. The French, of course, have always covered the masters: Camille Claudel by Bruno Nuytten in 1988, Van Gogh by Maurice Pialat in 1991, Renoir by Gilles Bourdos in 2012 and last year Rodin by Jacques Doillon. Now we have Édouard Deluc’s Gauguin. 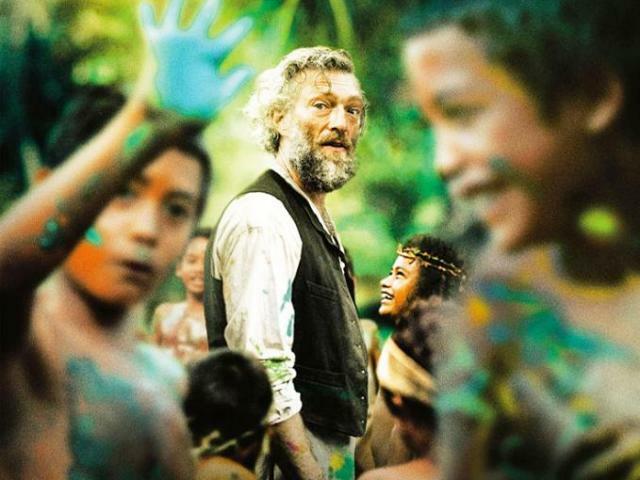 The film covers the period from 1891 to 1893, when Gauguin left Paris to move to Tahiti for the first time. He wanted “to reconnect with ‘wild’ nature, which had already led him to Brittany, Panama, and Martinique, and to find his muse, his ‘Primitive Eve,’ the woman who will distinguish him,” according to the director, Édouard Deluc. After failing to convince his Danish wife Mette (Pernille Bergendorf), five children or any of his artist friends to join him, he sets off, impoverished and alone. For the next 18 months he worked feverishly, creating 66 works, but his output wasn’t well received at the time (today, of course, many of them are considered masterpieces) and he battled constantly for enough money to buy materials and food. In Gauguin, he meets and marries a young Polynesian woman Tehura (Tuheï Adams), who inspires him and who he paints over and over again, but in fact she is a composite of many of Gauguin’s lovers. As Deluc explains, “my artistic license as a filmmaker allows me to imagine it without having to justify myself.” Fair enough - this isn’t a documentary after all. There’s trouble in paradise though, in the form of a younger rival for Tehura’s affections, Jotépha (Pua-Taï Hikutini), and this provides tension in the film that, again, didn’t actually exist. What is certainly true, though, is that Gauguin returned to Paris in 1893 destitute, on a state-provided free passage. Vincent Cassel is utterly convincing as the driven artist who cares little for anything outside his work. His gaunt face says more than words can that this is a man who will sacrifice everyone and everything to his art. The screenplay is not wordy but, with a visage like Cassel’s, explanation is largely unnecessary; his expressive face speaks volumes. Tuheï Adams is exotically beautiful and it’s easy to see why Gauguin would have been beguiled by Tahitian women with her representing them. She’s a very good actor too, in a role that is not verbose. Locations are suitably remote but this isn’t a picture-book paradise - the weather is often overcast or rainy - and the island’s ruggedness is accurately lensed by Pierre Cottereau’s camera. Interestingly, Australian composer, multi-instrumentalist and frequent Nick Cave collaborator Warren Ellis is responsible for Gauguin’s somewhat morose soundtrack. This isn’t a film for all tastes, its pace is even and there aren’t big peaks and troughs, but for anyone interested in the lives and motivations of artists, Gauguin goes some way to getting under the skin of that unique group of people who are driven to create, regardless of the cost to themselves or those that love them.